Experimenting with new and innovative weightlifting exercises can be fun, but when you want guaranteed results, nothing beats a classic. Enter: the overhead press. Not only is it a go-to move for those looking to build big shoulders, it’s also a good foundational exercise for any good upper body weightlifting routine. That’s because an overhead press strengthens muscles of the shoulder, which, in turn, helps improve power in your upper body. “Your shoulders carry out many of your upper body movements, which makes them integral to your everyday functions,” says Openfit fitness specialist Cody Braun. If you want to be more efficient at lifting, pulling, or pressing objects, strong shoulders will help you with that. Keep reading to learn how to practice proper overhead press form, and why you should add this move to your fitness routine. Stand tall with your feet shoulder-width apart, holding two heavy dumbbells at shoulder height, palms facing each other. 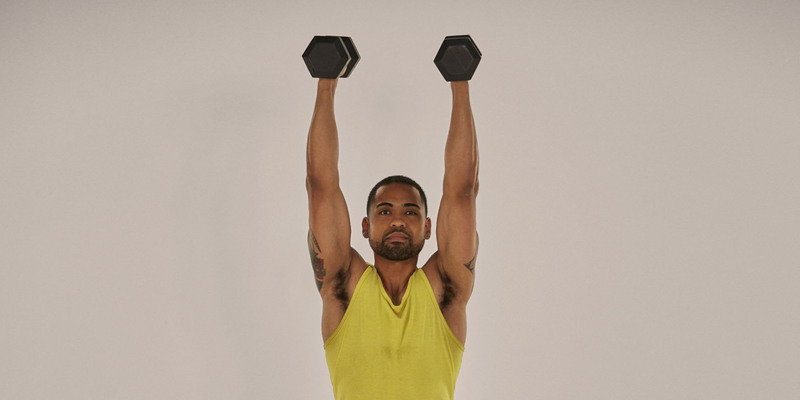 Keeping your elbows in, slowly press the dumbbells upward until your arms are straight. Lower your hands back to your shoulders and repeat. Adjust the intensity of the dumbbell overhead press by changing the amount of weight you’re lifting: make it easier with lighter dumbbells or make it harder with heavier dumbbells. Like all exercises, good form is key to getting results. If you’re arching your back during the exercise, you likely need to switch to lighter weights. Or, sit in an upright bench for back support, Braun suggests. And if you think you can’t do this move because you don’t have access to dumbbells, you’re in luck: you can do this move just as effectively with resistance bands. Just stand on the center of a resistance band with your feet shoulder width apart and bring the handles to your shoulders with your palms facing each other for the starting position. Additionally, the neutral grip involved in the overhead press also tends to make it easier on your shoulder joints, as compared to other moves that use different grips, like the military press which has the palms facing forward. What Muscles Do Overhead Presses Work? Within your shoulder, you’ll find the deltoid muscle and the rotator cuff. The deltoid gives your shoulder size and definition when it’s developed. The rotator cuff stabilizes the shoulder joint, which is extremely important since the shoulder is one of the most mobile joints in the body. The overhead press also targets your triceps. The deltoid muscle has three sections, called “heads:” the front (anterior), middle(lateral), and back (posterior). The front head is responsible for raising your arm up and in front of you. The middle head lifts your arm out to the side. And the rear head moves your arm behind you, and lifts it to the side when you’re lying on your stomach. The three heads always work together as one unit, although some movements can emphasis some fibers more than others. In the case of the overhead press, most of the emphasis is placed on the anterior and lateral heads. Your triceps – the horseshoe-shaped muscle on the back of your arm – make up about two thirds of your upper-arm musculature. Each tricep (one on each arm), is composed of three heads. The lateral and medial heads originate at the humerus (upper arm bone) near the shoulder, and the long head originates at the scapula (shoulder blade). They all fuse together and attach to the elbow by a single tendon. The lateral and long heads are the most visible, forming the classic “horseshoe” shape (long head on the inside, lateral head on the outside). The medial head lies under the other two, and while it doesn’t contribute much to the shape of the muscle, it does contribute significantly to its overall mass.